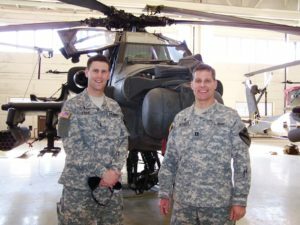 Grace Brethren chaplains Pete Stone (left) and John Jacobsen have been recommended for promotions to the rank of Major in the U.S. Army. Two Grace Brethren military chaplains have selected for promotion and continued service, according to news received from Mark Penfold, chaplain endorsing agent for the Fellowship of Grace Brethren Churches. “We celebrate God’s leading in their lives as they will move on to positions of increased responsibility and covet your prayers for them as they share the Gospel in our military,” says Penfold. For more information on Grace Brethren military chaplains, see the website of the Eagle Commission.